Microsoft has a massive, 27 petabyte data center out in the ocean. Wanna see what it’s like there? This video feed shows you the fish swimming around it. The data center is part of Microsoft’s Project Natick, a research project with the stated goal of “determin[ing] the feasibility of subsea datacenters powered by offshore renewable energy.” In other words, can we put data centers underwater and keep the lights on without burning planet-destroying fuels. So far, the experiments seem to be going well. As far back as 2013, the research team found that a much smaller version of the vessel only raised the surrounding temperature by only a few thousandths of a degree Celsius. That small vessel was phase one of the project. Phase two is what you can (kind of) see above. A full-size data center that stores over 27 petabytes of data. With an underwater cable connected to the internet, this data center can live underwater, cooled by the ocean—which dramatically reduces both the financial and environmental costs of running a data center of this size—without disturbing the environment. Which leads us to the cameras. As part of phase two, Microsoft wants to monitor the surrounding environment to make sure that the local ocean life isn’t disturbed by the new data center. 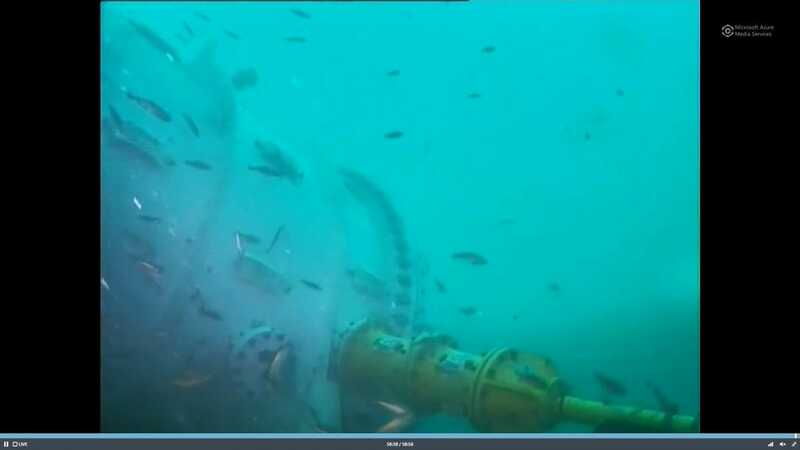 Part of that means physically monitoring the fish with cameras, which you can also watch. The feeds (found at the source link below) are a tranquil digital aquarium. From the outside, you’d be hard-pressed to tell the difference between this state of the art data center and the wrecked internals of 20th-century ship. It’s an eerily calm scene as huge schools of fish swim past and around the camera. Microsoft might get more practical use out of the information, but if you want something calming to put on while you work, check out one of the two feeds at the link below.